Every time I go to WIA, I am struck by the same things that make the show great – classes taught by master woodworkers in which you can ask questions directly to these folks you have idolized for years, a marketplace filled with beautifully made tools and the expert artisans who can show you the ins and outs of each tool while you stand at their booth, the camaraderie of your fellow woodworkers walking back and forth from class to marketplace and back again. And of course there are the other things you can count on, like the guys at the Lost Art Press booth consistently being the funniest people you will meet all year, like Roy Underhill and Megan Fitzpatrick taking over the loudspeakers at the Marketplace to tell people they are hungry for dinner so get the *bleep* out, like Scott Meek, Jason Thigpen, Anne Briggs Bohnett and so many others gathered in their booths chatting and smiling and welcoming to all. But one specific interaction really stuck out for me as an example of why you would want to attend Woodworking in America every year if you are a woodworker. 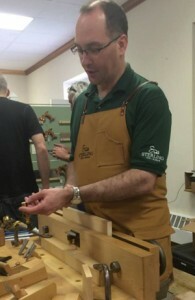 I was standing at Chris Kuehn’s Sterling Toolworks booth, and he was talking to a woodworker who mentioned that he struggled with dovetails and needed to improve his sawing technique. Chris instructed him to come around to the inside of his booth, set a piece of wood in his vise with the endgrain up and pulled out a hand saw, and proceeded to provide him with a way forward to becoming a better sawyer. Mark straight lines all the way down this 1×6 from right to left, said Chris, and then saw each of those lines. Once you’ve sawed all the way across that board, you are done for the day. If you can stay on the line by the end of the first day, you are ready to move on to the next exercise. If you are straying from the line, then cut off the top 2″ of the board to a clean part, and do another night of the same exercise. Within 3 nights, most people are clearing the lines at will (only kerfs show, no pencil lines). If you are not you have “saw issues” where it is not tracking correctly due to improper sharpening or you have body mechanic issues where you need feedback to adjust your body mechanics. Once you have worked sawing straight vertically on command, it is time to work on a slope; use a dovetail marker or sliding bevel to mark diagonals from right to left all the way across your board, and saw each of those lines. Again, you are looking to track the line with your saw kerf so that you don’t see a line. You are gaining muscle memory by doing so many of these cuts all in a row. Do the same thing each day until you do it reliably. Then switch to the opposite angle. When you can cut to a line in these three instances, your dovetailing with be 1000% better. Not to mention you will be a much better hand sawyer! Hearing Chris Kuehn talk to this burgeoning woodworker inspired me. It made me want to practice my sawing and take a better shot at good dovetails. And it made me understand, once again, the true value of attending an event like Woodworking in America. Not only are you in classes and a market filled with woodworking experts and a great selection of tools to work with, but those experts will freely and happily give you their knowledge, if you only stop to ask. I will be returning to Woodworking in America again, and I will make sure to gather my questions beforehand. And I will make sure to stop and ask.